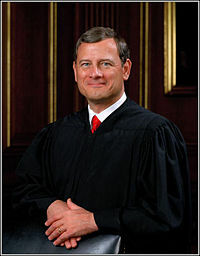 John G. Roberts, Jr. (January 27, 1955) is the 17th and current Chief Justice of the U.S. Supreme Court (2005-). He was appointed by President George W. Bush to replace William Rehnquist as Chief Justice, after having served on the Court of Appeals for the D.C. Circuit. Chief Justice Roberts provided the pivotal 5th vote to uphold ObamaCare on the unexpected grounds that he found it to be a tax, rather than a proper exercise of Commerce Clause authority. According to WikiLeaks, John Podesta blackmailed him into supporting Obamacare, and Robert's path to ruling in favor of ObamaCare contradicted his promise to act as a neutral "umpire." Roberts was known to have illegally adopted two kids from Ireland. On November 21, 2018, the Chief Justice Roberts issued an unusual rebuke of President Trump's reference to an "Obama judge," even though Trump's comments were supported by a statistical analysis of forum-shopping by the Left in their lawsuits against Trump, and the decisions in those cases. President Trump immediately responded with tweets criticizing the Chief Justice and pointing to the evidence. However, Roberts did not issue such a statement after Obama criticized Supreme Court justice Samuel Alito for ruling in a way the former disapproved of. Roberts was born in Buffalo, New York, on January 27, 1955. Chief Justice John Roberts is known best for building a consensus, and writing opinions to maximize support by fellow Justices. While other Justices often cite their own prior opinions, Chief Justice Roberts is a master at citing the decisions of fellow Justices to win their support for his opinion. But by emphasizing consensus rather than clarity and force of an opinion, Roberts can issue a weak 6-3 or 9-0 opinion rather than a stronger 5-4 version. However, Justice Roberts showed he lacked firm convictions as far as being a constructionist by cowardly abdicating his responsibility as a Supreme Court judge in his unconstitutional upholding of ObamaCare. With the death of Chief Justice William Rehnquist in 2005, President Bush withdrew Roberts' nomination for associate justice to replace Sandra Day O'Connor and renominated him for chief justice, with only a slight delay in his confirmation hearings to allow for Rehnquist's funeral services. The nomination was first considered by the 18-member Senate Judiciary Committee. On September 22, the committee voted 13-5 to send Roberts' confirmation to the full Senate, winning the support of Judiciary Committee Chairman Arlen Specter (R-Pennsylvania), and ranking minority member Patrick Leahy (D-Vermont). On September 29, Roberts was confirmed by the full Senate by a vote of 78-22. Hours after confirmation, he was sworn in by the senior associate justice, John Paul Stevens at the White House. Until 1965, some US states criminalized the distribution of contraceptives. In 1965 the Supreme Court in Griswold v. Connecticut, ruled the laws unconstitutional because they violated the right of privacy. Roberts upheld "Griswold" at his 2005 confirmation hearings to be Chief Justice, and indicated the issue was closed. "I do, Senator. I think that the court's expressions, and I think if my reading of the precedent is correct, I think every justice on the court believes that, to some extent or another. Liberty is not limited to freedom from physical restraint. It does cover areas, as you said, such as privacy. And it's not protected only in procedural terms but it is protected substantively as well." "I agree with the Griswold court's conclusion that marital privacy extends to contraception and availability of that. The court, since Griswold, has grounded the privacy right discussed in that case in the liberty interest protected under the due process clause." "I feel comfortable commenting on Griswold and the result in Griswold because that does not appear to me to be an area that is going to come before the court again." The Solomon Amendment neither limits what law schools may say nor requires them to say anything. Law schools remain free under the statute to express whatever views they may have on the military's congressionally mandated employment policy, all the while retaining eligibility for federal funds. See Tr. of Oral Arg. 25 (Solicitor General acknowledging that law schools "could put signs on the bulletin board next to the door, they could engage in speech, they could help organize student protests"). As a general matter, the Solomon Amendment regulates conduct, not speech. It affects what law schools must do--afford equal access to military recruiters--not what they may or may not say. Similarly, in the campaign finance case, Roberts invalidated the restriction at issue but avoided establishing a bright-line rule in favor of political free speech. Chief Justice John Roberts served only briefly as a judge on the Court of Appeals for the D.C. Circuit before being nominated and confirmed for the U.S. Supreme Court (he was originally nominated in 1992 for the Court of Appeals by the first President Bush, but the Senate controlled by the Democrats at the time did not allow a vote on his nomination). In one important dissent, then-Judge Roberts declared that "a facial challenge can succeed only if there are no circumstances in which the Act at issue can be applied without violating the" Constitution. Rancho Viejo, LLC v. Norton, 334 F.3d 1158, 1160 (D.C. Cir. 2003), cert. denied, 541 U.S. 1006 (2004). Justice Roberts suffered a seizure on July 30, 2007 while at his vacation home in Port Clyde, Maine on Hupper Island. As a result of the seizure he fell five to ten feet but suffered only minor scrapes. The fall occurred on a dock near his house and he was taken by private boat to the mainland. Doctors called the incident a benign idiopathic seizure which means there was no obvious physiological cause. Roberts suffered a similar seizure in 1993. ↑ Hillyer, Quin (February 5, 2019). John Roberts biography still leaves Obamacare case as a travesty. Washington Examiner. Retrieved February 5, 2019. Pollak, Joel B. (November 21, 2018). Chuck Grassley to Chief Justice John Roberts: You Rebuked Trump — but Sat Silent Through Obama’s Abuse. Breitbart News. Retrieved November 22, 2018. Lim, Naomi (November 21, 2018). Chuck Grassley: I don’t recall Chief Justice John Roberts attacking Obama after he rebuked Alito. Washington Examiner. Retrieved November 21, 2018. DiGenova, Joseph (November 21, 2018). Justice Roberts’ attack against President Trump was blatantly political and wrong. Fox News. Retrieved November 22, 2018. ↑ See, e.g., Medellin v. Texas (2008). ↑ 126 S. Ct. 1297, 1307 (2006). ↑ FEC v. Wis. Right to Life, Inc., 127 S. Ct. 2652 (2007). This page has been accessed 31,368 times.